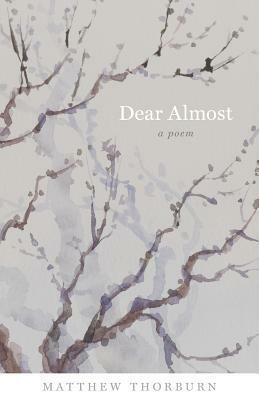 Dear Almost: A Poem by Matthew Thorburn, which toured with Poetic Book Tours, is a book length poem exploring a year-long tangle with grief after a miscarriage. Broken into the four seasons, the poem rises and falls with the ebb and flow of melancholy. It attempts to illustrate the loss of what could have been or what almost was or even what you wanted to be. It’s the loss of potential … the loss of discovery of that being. Grief often paralyzes us, makes us sound unlike ourselves and unable to articulate what is happening to us emotionally. It is even harder for us to connect with others who reach out to us to help us through that pain, and many times we choose to withdraw, to forget, to hold that grief unto ourselves because we don’t know how to express it, how to share it, or how to process and let it go. so still, not there anymore"
Dear Almost: A Poem by Matthew Thorburn is beautiful in its attempt to articulate that which we cannot explain or even deal with. Matthew Thorburn is the author of six collections of poetry, including the book-length poem Dear Almost (Louisiana State University Press, 2016) and the chapbook A Green River in Spring (Autumn House Press, 2015), winner of the Coal Hill Review chapbook competition. His previous collections include This Time Tomorrow (Waywiser Press, 2013), Every Possible Blue (CW Books, 2012), Subject to Change, and an earlier chapbook, the long poem Disappears in the Rain (Parlor City Press, 2009). His work has been recognized with a Witter Bynner Fellowship from the Library of Congress, as well as fellowships from the Bronx Council on the Arts and the Sewanee Writers’ Conference. His interviews with writers appear on the Ploughshares blog as a monthly feature. He lives in New York City, where he works in corporate communications. I like the parts you chose to quote here. Wonderful review. It sounds like a beautiful and touching collection. This sounds powerful. I’m glad I won a copy in the giveaway and look forward to reading it.